The Spanish Group is the world’s leading certified translation services company with services available in over 90+ languages! We provide top-notch efficacy and linguistic accuracy while also being among the most cost-effective on the market. We stand out from the competition because of our exhaustive quality control and strict privacy procedures. No matter what our clients’ diverse needs may be, we are confident our translation solutions exceed expectations! The Spanish Group LLC is directly endorsed by several government organizations and academic associations for certified translation services USCIS, so look no further! We are a verified veteran when it comes to delivering reliable support to our clients in the fastest, most cost-effective, precise means! 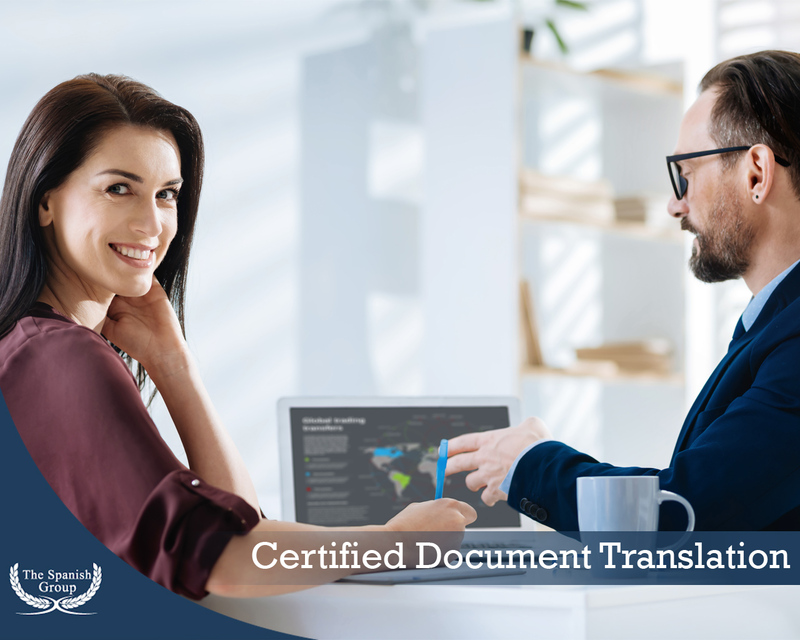 Every clients’ private and confidential information is kept safely secured and most certified translation services are finalized in less than 48 hours. If you are an individual who has recently moved or a huge company with hundreds of employees, our proven professional Spanish document translation services will guarantee your personal requests are prioritized and surpassed. Our dedication to customer support and quality control will ensure your needs are not just met, but you will receive luminary treatment as our client. Most translations are delivered in less than 24 hours, but for those clients’ that require immediate service, we offer a guaranteed same-day document translation service. The Spanish Group diploma translations are highly recommended because our certified academic documents are accepted in practically all academic institutions and agencies. The turnaround for most diploma translations can be as soon as the same day. All certified translators at the Spanish Group have been background checked and are lawfully bound to maintain the confidentiality of our clients’ sensitive information. Getting started with the Spanish group is easy and pricing is located on our main website so everything is transparent with our clients. In addition to the services above, The Spanish Group offers other translation solutions including corporate translation, legal translation, and Spanish website translation. No matter how big or small your needs are, The Spanish Group LLC is your #1 choice for premier translation services for 2019 and beyond! This entry was posted in Uncategorized on January 20, 2019 by Admin. Why Quality And Translations Should Go Hand In Hand?